Getting your billing preferences correctly set-up from the outset is an important part of your ongoing Habu experience. In this help doc we outline all of the relevant settings, where you find them, and how they appear to your members. 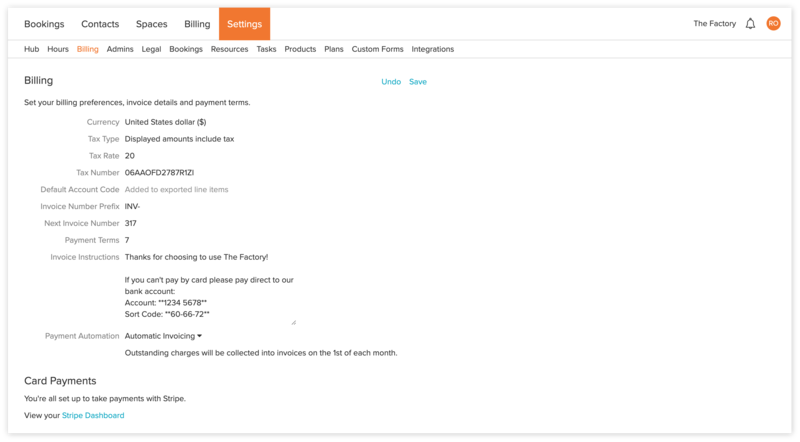 It's also important to note that the content and appearance of your invoices are dependent on the settings you've made in Habu. Country: The first step is to set your locale by selecting your country. This dictates what currency options you'll have available to you when you go set your currency. Logo: Adding your logo provides an enhanced branded experience when you invoice. Currency: Select your currency from the dropdown menu. You will have the option of your national currency, as well as the international currencies of $ (USD) and € (Euro). Habu doesn't currently support using multiple currencies i.e. a national currency and an international currency. Tax Type: There are three options: (1) displayed amounts include tax, (2) displayed amounts do not include tax and (3) we don’t charge tax. These choices do not affect any values in Habu. Adjusting this does not effect invoices that have already been created. Tax Rate: This is the percentage (%) of tax that you should set according to your local tax rates if you add tax to your customers. Tax Number: This is typically a government issued number for your organisations' sales tax account, known in different parts of the world as VAT, GST, TIN, TVA, Momsnr. (See Wikipedia for more details). This is displayed on invoices and receipts sent from Habu. You can use just the number or choose to include the country code. Default Account Code: This is primarily for ensuring your billing data in Habu is correctly categorized. Adding a default account code will add this code to all billable items. You can override this for any individual billable item (e.g. products, plans, spaces, resources) by entering an account code for that item. If you are using this with the Xero integration it's important to ensure that you are using a pre-existing account code in Xero. Next Invoice Number: This number increases with every invoice sent. You can start at any number desired whether that’s 12 or 1200. This is used as a default only as you can change an Invoice Number manually on any invoice. It's useful when you transition to using Habu invoicing from your previous system as you can maintain the correct number sequence for invoices. Payment Terms: This controls the default due date on an invoice. An invoice due date can still be set manually on any invoice however this control can save you time by automatically adding a number of days to the Invoice Date e.g. the due date can be automatically calculated to be 14 days after your invoice date. Default Account Code: If you use account codes with Xero or any other accounting system this will be the default account code used for line items if you add this. You can add individual account and product codes for resources and spaces. Invoice Instructions: You can use this to add any other information that you'd like such as bank account or payee details. You can format the text here to display things how you'd like using markdown. Card Payments: If you are in a country that accepts Stripe payments, you can connect your Stripe account to Habu. This will enable the 'Pay Now' button which means your customers can pay via a debit or credit card directly from the invoice. More details on the Stripe integration can be found here.